DayZ Creator: "I Am Angry About The War Z"
Dean Hall sounds off on what the debacle has done to his reputation. 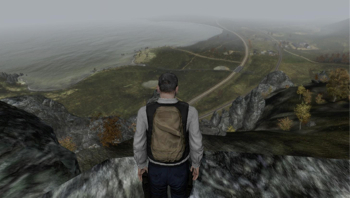 In an Ask Me Anything thread on Reddit this week, DayZ creator Dean "Rocket" Hall fleshed out his feelings on The War Z, the remarkably similar zombie survival MMO that was announced shortly after DayZ became a gaming phenomenon. And while it now appears clear that War Z is a hurried attempt at cashing in on the craze, Hall notes that the similarities between the two games - and even the suspiciously parallel titles - have damaged his own reputation. "I am angry about the War Z. I'm very angry. I'm quite hurt personally because anyone can see how similar the words are, and while the average gamer knows the difference individual people don't," Hall explains. "I've had family members/close friends mistake the difference and confront me about what they believed was unethical behavior they thought I was making." War Z developer Hammerpoint Interactive has done just about everything in its power to fumble the release of the game, managing to have the title pulled from Steam shortly after its debut. At the time the game was put up for sale on Valve's digital marketplace, it was utterly unfinished, yet advertised all of its missing features as being present. This, of course, lead to a harsh reception from just about everyone willing to take a stance on the matter. The company later apologized, but the damage was already done. As far as the similarities between the two games, Hammerpoint has remained consistent in its claims that it's all merely a coincidence. Early on, the company insisted that The War Z had been in development since 2011. However, some forum diving on the part of naysayers has unearthed possible evidence that not only was the game heavily influenced by DayZ, but that War Z may have only had a 6-month development window before being pushed out to the masses. Regardless of which side you're on, the drama between the two franchises is clearly still simmering. Hopefully the eventual release of the standalone DayZ product will be the final chapter in this weird saga of the undead.